Hazar Imam’s “Esoteric” Quran or Allah’s “Clear” Quran? Aga Khan claims to his followers that he brings an esoteric (baatini or hidden) meaning of the Quran which has not been understood by the Muslim ummah. Ismailis are also made to believe that the Qur’an was time-bound and was not meant to be a universal message for all times and that their spiritual leader, Prince Karim Aga Khan, is the “walking and talking Qur’an” and his religious pronouncements, whatever they may be, are the guidance and esoteric interpretations of the Qur’an for the present times. The fundamental article of faith that there will not be any new revelations (wahy) after the Qur’an, is completely violated by the Ismailis. I would like to say to my Ismaili brothers and sisters: Did Aga Khan and his missionaries explain their meanings and philosophies from the Holy Qur’an to you? They use every book other than the Qur’an. They dramatize stories of their ancestors and relate ridiculous miracles of their Holy Pirs and Imams, without any reference to the Book of Allah. They never ever speak from the Glorious Qur’an, except a couple of aayahs here and a few words there. They discourage you to read and recite the Qur’an , and regularly warn you not to try and understand the meanings of the Glorious Qur’an. They warn that if you try to understand the meanings, you will be misguided. They warn you that every aayah has 1000 meanings each. They just tell you to obey them and you will be taken care of in the hereafter. If Aga Khan interprets the Qur’an and provides his followers the interpretation, then instead of thousands of arguments, show us just one aayah of the Qur’an interpreted by the Aga Khan? Anyone who has had close contact with Aga Khan or any of these missionaries will know that these missionaries are hypocrites, and all they are ever interested in is more power and more wealth. They have sold the words of Allah for a miserable price, and have been successful in misguiding and taking a multitude of people away from the clear guidance and open teachings, which Allah has revealed, in His mercy for our guidance. Indeed those, who conceal the commands that Allah has sent down in His Book and barter them away for paltry worldly gains, fill their bellies with fire. Allah will not speak to them on the Day of Resurrection, nor will He regard them as pure and there is a painful torment for them. Those who conceal the clear (Revelations) and Guidance We have sent down, after We have made it clear for the people in the Book, on them shall be Allah’s ‘laanah’ and the ‘laanah’ of those who are entitled to curse. Just have a look at these clear aayahs of the Holy Qur’an and judge for yourself, who has a bigger right that he should be believed? Allah or these self-proclaimed unscrupulous holy men? We have made this Book easy in your own tongue so that they may ponder and take good counsel. Allah Himself declares that the Book is easy, so that you may ponder and take good counsel over its verses. Did not these corrupt men say to the Ismaili community that the Qur’an is difficult and impossible to understand? Haa Meem. By this lucid (clear or open) Book. We have made it an Arabic Qur’an, so that you may understand it. Allah Himself declares this Book is ‘mubeen’ (clear or open), and Allah, in His Mercy, made it ‘mubeen’ so that we could understand it. So who are these people who claim that the Book has several hidden meanings and is impossible to understand? And leave alone those who have taken their ‘deen’ as a sport and past time, and have been deluded by the life of this world. Nevertheless, you go on admonishing them by reciting the Qur’an to them, lest any person should be seized because of his own deeds; and that too, at a time, when there would be no protector, no helper and no intercessor to rescue him from Allah; when no conceivable amount of ransom would be accepted from him. This is because such people shall be seized, in consequence of what they themselves had earned. Allah Himself declares to admonish these people from the Qur’an, lest one should be seized by Allah because of his own deeds, and that too at a time when no protector, no helper and no ‘shafaa’ will be able to rescue him from Allah’s anger, wrath and punishment? Then who are these people who have falsely promised the entry into Paradise for each and every one of their followers? These are the verses of the Book that makes its object perfectly clear. We have sent it down as a Qur’an in Arabic, so that you may understand it well. Allah Himself declares that the aayahs of the Holy Qur’an makes its objective or mission perfectly clear and He, in His Mercy, has sent us the Qur’an so that we may understand it well. Then who are these people who have the audacity to go against these declarations of Allah and say that the Qur’an is confusing, and has several meanings, and we will never be able to understand it? We have sent down to you this Book, which makes everything plain, and is a guidance, blessing and good news to those who have surrendered themselves entirely. Allah says that the Book makes everything plain, and is a guidance, blessing and good news for the believers. So who are these people who are engrossed day and night in proving that the Qur’an is complicated and impossible to understand? O Muhammad, We have made this Qur’an easy, and sent it down in your tongue so that you should give good news to the pious and warn the stubborn people. 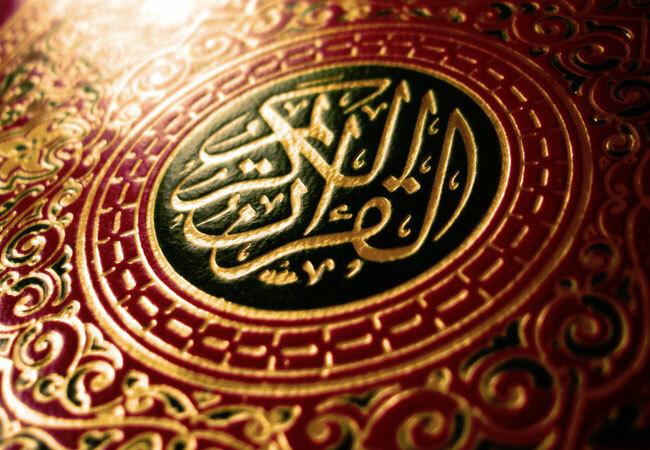 Allah declares that He, in His Mercy, has made the Qur’an easy so that it may act as a source of good news to the God-fearing people, and it may be used to warn the stubborn people, who blindly believe in others as their helpers and protectors besides Allah without an iota of authority from the Lord of the worlds. All praise is for Allah Alone, Who has sent down this Book to His Servant, and assigned nothing crooked to it. This Book says everything directly, so that he may warn the people of the severe chastisement of Allah and give good news to the believers, who do righteous deeds, that they will have an excellent reward. Not understanding and not following the clear and open guidance and teachings of the Holy Qur’an is nothing but rejecting it. Following anyone like Aga Khan blindly, without any authority from the Qur’an, is rejecting it. Believing someone’s promises over and in contradiction of the clear promises of Allah in the Qur’an is rejecting it. Take the word of man supreme over the words and decisions of Allah, is nothing but rejecting it. Brothers, come back to the Qur’an that clearly expounds the Truth from Allah, and be not of those disobedient to Allah and His Words and Commands. So, hold fast to the Book that has been revealed to you, you are surely on the Siraat al Mustaqeem. The fact is that this book is a great honor for you and your people, and soon you shall be called to account for it. Here is the decision of Allah from the Glorious Qur’an. Hold fast to the Book of Allah and you are on the Siraat al Mustaqeem. Hold on to the Aga Khan self-proclaimed leader, and await your call in the court of Allah. Furthermore, Allah Himself declares, that this Book is a great honor for the believers, and soon, we shall all be called to account for it, in the court of Allah. Just imagine the plight in the court of Allah, when some will come with Aga Khan as their leaders, and some people will come holding the Qur’an. Who do you think has followed Allah’s commands? My beloved Ismaili brothers and sisters, our duty is only to invite you to read and understand the Holy Qur’an and hold fast to the words of wisdom of Allah. This way you will never ever be misguided. Hold on to all the ‘damans’ of all the leaders, and prepare for an inevitable Day. You be our witness that we called you to the Qur’an and its understanding and implementation, and Allah is enough as our witness. We all have an appointment with the Angel of Death, and once we are in that dimension, all the realities will be open and clear in front of our eyes. Those who held on to the clear guidance and teachings of the Holy Qur’an will find that every promise made by Allah will come true. And those who held on to the false interpretation and guidance of their self-appointed leaders and Imams,will find that none of their promises had any weight in the first place. My beloved Ismaili brethren, do not be the ones hanging on to false hopes and the villainous promises of the ‘damans’. They are nothing but falsehood. Do not be the first ones to reject the Qur’an, after Allah, in His Mercy, has made His Commandments clear and open to you. Do not be the ones to enflame on yourselves the everlasting and unbearable torture of the fire of Hell. Do not take the words of any man supreme, in contradiction to the words of Allah. Do not be the ones to bring an enervating and intolerable punishment of Allah decreed on yourselves. Read the words of Allah with understanding once, and then, judge for yourself what is the Truth and what is False. If after reading the Qur’an, you still think that these self-made leaders and self-proclaimed holy men are deserving of your invocation, of your prayers, of your supplications, of your subjugation, of your subservience, of your obedience, of your tasleems and of your prostration, by all means, go ahead and do as you please. But at least, give the words of Allah one chance to prove itself as the Truth. Think hard deep in your hearts, and decide for yourself, if the Lord and Creator who created you, deserves that His Message should be followed or not? Just give a moment’s thought about who are you dealing with? Who is this Allah? What are His rights on His slaves? Who is this ‘ar-Rahmaan’? Recognize Him through His noble attributes mentioned by Himself in the Holy Qur’an, and you will never need another unauthorized fake interpreter or imam, in this world and in the Hereafter? There is absolutely nothing like Him (Allah) in the whole Universe… He is the All-Hearing, The All-Seeing.. To Him Alone belong the keys of the treasures of the heavens and the earth..
Say: He is Allah, the One and Only. Allah is Independent of all, and all are dependent on Him. Neither has He any offspring, nor is He the offspring of anyone; and none is equal to Him in rank. He (Allah) created death and life that He may test you, to see which of you is the best in deeds. Allah says in the Holy Qur’an Chapter 15 Surah Hijr verse 49-50: Prophet (saws). I have not created the jinn and men except for this that they should worship Me alone. It was Shaitaan who was frightening the people with the fear of his ‘awliyaas’; therefore, in future, do not fear men, but fear Me (Allah), if you are true believers. And there is no reason why I should fear those beings you associate with Allah, when you are not afraid of setting up partners with Allah without any authority. Then tell me, which of the two parties merits peace and freedom from fear? It is those who believe and do not confuse their beliefs with wrong, that are truly in security, and they are the ones who are rightly guided. O mankind, A parable is related to you, so listen to it. Those on whom you call besides Allah, cannot create a fly, even though they may all combine together for this purpose. Nay. If a fly snatches away anything from them, they would have no power to release it from the fly. How weak are those who petition, and how weak are those to whom they supplicate. And if My servants ask you, O Prophet, concerning Me, tell them that I am quite near to them. I hear and answer the prayer of the suppliant, when he calls on Me. So let them respond to My call and believe in Me. (Convey this to them), perhaps they may be guided aright. Allah Alone is our Creator, or Protector, or Lord, our Fashioner, our Provider, our Judge, our Preserver, our Maintainer, our Reckoner, our Originator, our Restorer, our Pardoner, our Governor, our Enricher, our Gatherer, and our Resurrector. He Alone is The Beneficent, The Merciful, The Mighty, The Compeller, The Holy, The Majestic, The Evolver, The All Knowing, The Subduer, The Bestower, The Exalter, The Honorer, The Aware, The Hearing, The Just, The Watchful, The Witness, The Praiseworthy, The Truth, The Alive, The Eternal, The Noble, The Powerful, The One, The Unique, The First, The Last, The Avenger, The Guide, The Incomparable, The Patient, The Giver of Life, The Giver of Death, and the Lord of Majesty and Bounty. My beloved Ismaili brethren, recognize your Creator, and you will never need another false Interpreter, Guide, Imam to hold. He Alone is sufficient for the believers, and the ones who indeed believe in Him, put all their trust in Him. There is nothing like unto Him in the Whole Universe. He is Allah, the only Master of the day of judgment. May Allah guide all Ismailis to Siraat al Mustaqeem. May Allah open your and our hearts to the understanding of His Message, which He, in His Sublime Mercy has revealed for our guidance. May Allah have mercy on us, help us, and forgive us our sins. May Allah guide Ismailis to read and understand the simple and plain words of the Glorious Qur’an. May Allah increase our knowledge from the Holy Qur’an. May Allah guide us to the Siraat al Mustaqeem.